As friendly and thoughtful as he is tall, Michael first called Just Harvest months ago “just in case” he wound up needing help with his first application to the Pennsylvania Department of Human Services (DHS) for food stamps. He was, in fact, initiating a process that would challenge his determination at every turn. Unfortunately, obtaining the resources that Michael is eligible for became a saga full of confusion, unnecessary delays, and more avoidable errors than anyone in need of assistance should have to face. Back in April, Dontika Hall, one of Just Harvest’s food stamp specialists, took Michael’s call about what documents he’d need for his food stamps application. He was already receiving medical assistance, but an application to the Supplemental Nutrition Assistance Program (SNAP) is a separate process, even though DHS administers both federal programs. Like all SNAP applicants, Michael would have to provide proof of his income and of his housing, utilities, and medical expenses. For every applicant the exact documents required depends on their circumstance. So he was good – for three months. That’s how long SNAP recipients who are identified as ABAWDS – able-bodied adults without dependents – are allowed to receive food stamps. After that, they have to either 1) prove they are working at least 20 hours a week or are in a state-recognized job training or community service program; or 2) apply to be exempt from these work requirements due to homelessness or a certified medical disability. Otherwise, their food assistance is terminated. Jumping through an endless series of hoops is part of maintaining public assistance. All food stamp recipients have to submit documentation any time there is a change in income. They have to recertify – prove that they are still eligible for assistance – every six months. People who are unhoused have to recertify every year, as do seniors, though Gov. Wolf fixed the rule for seniors his first year in office. After years of advocacy by Just Harvest and other advocates, Wolf adoped a federal rule allowing SNAP recertification just every three years for seniors, who are typically on a fixed income. The thank you letter Michael wrote to Malaysia. 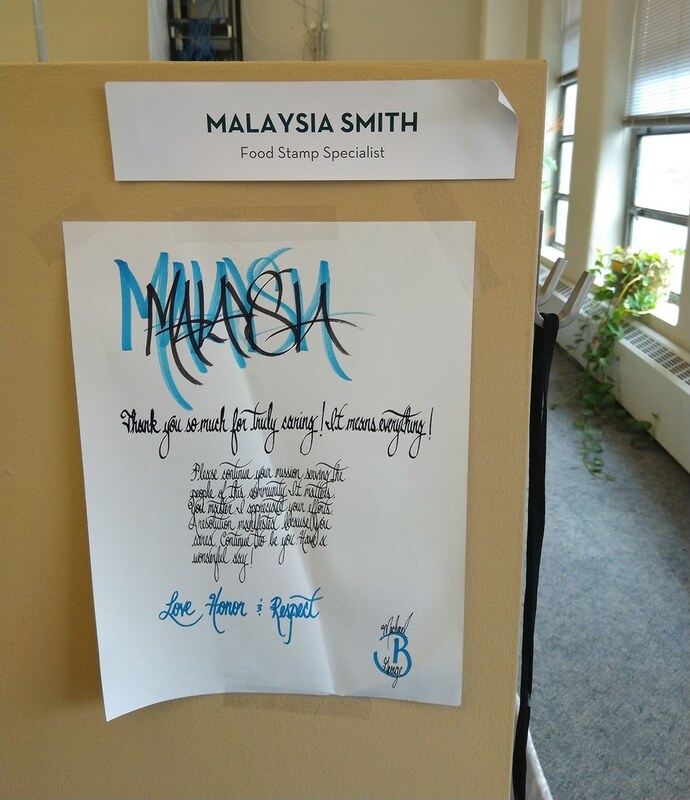 For Michael’s ABAWD food stamps recertification, Malaysia Smith, another of our food stamps specialists, was the one to help Michael. “She said ‘No Problem.’ She let me know what she needed and I decided to come into the office to give her all the documents.” Michael signed what he needed to and the re-certification was successfully submitted that day. “Once again, I received no response from DHS. Malaysia said she was looking into it. I decided to come into the office to help in the efforts of achieving a resolution.” This time the food stamp team manager, Ken, got involved. After a few days of Malaysia and Ken making numerous calls on Michael’s behalf, it was verified that DHS had received his documentation and that it was attached to his record. But the caseworker had not taken action. Unfortunately, this wasn’t the end of the saga. A few days ago he walked into our office with a friendly “Hey stranger!” holding a letter from DHS. “I got this yesterday. It says I’m due for a mandatory phone interview with DHS – on December 4th!” That was almost a week prior. His medical assistance was now up for annual review, and this had forced a recertification of his SNAP benefits. Due to the late letter, Michael was at risk of being unfairly terminated from both programs, so Ken got on the phone to DHS. They submitted the required paperwork to exempt Michael from work requirements, got him recertified for both his medical assistance and food assistance, and completed his semi-annual review (SAR). He should now be free of paperwork and phone interviews until his next SAR in May. But only time will tell whether things go as they should. And Michael’s circumstances may very well change. Perhaps even more than grateful, though, Michael was bewildered. Why had he had to go through so much to get so little? Medical coverage is precious these days, but the benefits he’s receiving certainly aren’t enough to live on. It simply didn’t make sense to him that a system that’s supposed to help people would do such a poor job of it. His experience had opened his eyes, and inspired him. Just Harvest works daily to help people like Michael get the assistance they’re eligible for. And we also advocate and lobby for the funds and sensible policies needed to make the system run smoothly and humanely. But in an era of austerity cuts, political rhetoric that vilifies people in poverty, and laws that criminalize them, helping people access the welfare system has always been easier than fully reforming it. That will only come when people like Michael have a seat at the table, creating the government policies that make life easier for working people, and improving the social safety net so it’s there for all of us when we need it – as all but the wealthiest of us will at some point in our lives. That’s the vision that guides us at Just Harvest. We hope you’ll join us and Michael in fighting to achieve it.